Over at the A to Z Blog, I’m talking about the importance of a theme for the Challenge. Outside of that, I didn’t know what to expect going in and avoided spoilers. I don’t do spoilers, but I will say, don’t go into this film expecting another Cloverfield. It’s an intense psychological drama/thriller. You will spend the entire time on the edge, trying to decide the truth. The main cast of three are all excellent. John Goodman is especially good – sympathetic and sad one moment, extremely terrifying the next. Mary Elizabeth Winstead was also great, as was John Gallagher, Jr.
It’s PG-13, so not that bloody violent, but it is intense. RiffTrax has two shows scheduled this summer and one of them is awesome!! It's our 10th birthday this July, and to celebrate, we think we could go even bigger for what will be our 20th RiffTrax Live Event: an MST3K Reunion Live Show, as well as a May 5th live show featuring a new HD transfer of the sci-fi classic from Vermont, TIME CHASERS! And too awesome – it’s already hit its Kickstarter goal. A RiffTrax: Live show featuring a reunion of the MST3K cast – what could be more amazing? The new trailer for Captain America: Civil War came out last week – you have to watch it to the very end! It's clear from the trailers that BATMAN V SUPERMAN: DAWN OF JUSTICE won't exactly be a cheery picnic full of sunshine and rainbow barfing unicorns, but the DCEU won't necessarily hang on to that darkness for all of its future installments. Chris Terrio, who re-wrote David Goyer's BATMAN V SUPERMAN script, was brought back to pen the script for JUSTICE LEAGUE - PART ONE and the screenwriter told the Wall Street Journal that he doesn't expect the film to be quite as dark as BATMAN V SUPERMAN will be. Just one month after its release, Deadpool has taken in over $708 million dollars world-wide. And just ten days after its release, Zootopia has grossed $431 million dollars world-wide. Whoa! I was chosen to select the theme for today – Guitar Solo! Every song has a magical moment. The point of a great guitar solo is to be that moment. The first in Sean McLachlan’s post-apocalyptic series is free on Amazon through today, March 14. The A to Z Challenge approaches! And don’t forget, the Great Theme Reveal is next Monday, March 21. What better way for a pack of wulfkin shifters to remain in seclusion than to hide in plain sight? Anyone else see 10 Cloverfield Lane? Excited about a MST3K reunion show? Getting excited for Civil War? Surprised how well Deadpool is doing? What music moves you today? And who’s ready for the Great Theme Reveal next week? Don’t forget to visit the A to Z Blog and my theme tips! I've finally sorted out my A to Z Theme and formatted half the posts...will complete the rest tomorrow! I'd love to join the A to Z Twitter chats, but the Thursday chat is at an awkward hour - it's about 4.30am in my time zone. I'll have to check out the Saturday chat time. I've been wondering about 10 Cloverfield Lane from the commercials. Sounds like it will be intense. I'm starting to really enjoy the Marvel movies and didn't think I would. Congrats to others with new releases. Have a blessed week, Alex. Yolanda's got a great cover there. Very splattery! Time for A-Z again! Wow, the year just flew by! Cloverfield sounds pretty cool...I especially like that it's PG-13 so probably not too intense for me. Goodman is an interesting choice...I still don't associate him with drama. Yes please to intense psychological drama. I really like Yolanda's themed new covers. Congrats to all authors with new releases. Theme -done. Posts - erm...getting there via a few detours. Off to check out the A-Z post now. Can you play this on your guitar Alex? I've contemplated doing the A to Z. I have a theme in mind and actually wrote a few posts so I guess if I can get more done I might participate. 10 Cloverfield Lane sounds really good. I'm going to add it to my list to go see or rent. Can't wait to see Civil War and Dawn of Justice. Already seen Deadpool and though Im not familiar with his comic universe, I loved it. Oh, have you seen the Deadpool flash mob dance promo they did for its release? Michelle, Saturday might be easier for you. Elizabeth, he did an outstanding job. Truedessa, that's why I picked this song. Haven't tried playing it yet. Probably can't! 10 Cloverfield Lane looks so scary from the previews. I love an intense thriller so it might be a great date night movie! I was so irritated by Cloverfield that I had already decided to just ignore the cloverfield lane thing. I'm still predisposed against it, but your review softens my resolve. and Yes, not found footage. That was so ridiculous. Thanks for your review of 10 Cloverfield Lane. If it was a sequel I wasn't interested. Now I am! John Goodman has been under-appreciated as an actor. I'm glad you liked the movie. I can't believe how far down our Google Friend Connect numbers have dropped. Is it finally over? Good luck to all the new book authors! From your description, I just might be able to handle Cloverfield! I mean, w/covering my eyes too, but I always do that. =) I do want to see Civil War, but I doubt it'll be until it's out on DVD. I would like to take the kidlet to see Zootopia though! Looks like there's a ton going on in the movie world. I hadn't heard of Cloverfield (live a little in our own world :) ), but you caught my interest. I can't wait to see the next Captain America movie. Plus a Mystery Science Theater reunion? So exciting! I really want to see 10 Cloverfield Lane, because it looks really interesting and I love John Gallagher Jr., but I haven't seen Cloverfield. I take it that it isn't really necessary? Your review convinced me to add 10 Cloverfield Lane to my must see list. (I'm hoping it includes footage salvaged from the Blair Witch camera crew. :) In recent years Scandinavian countries have been exporting a tremendous amount of music in the categories that interest me including prog rock, melodic metal and retro 80s Sunset Strip sleaze. I dig the sound of Redemption. I'm not too surprised Deadpool is doing so well. I think a lot of folks have been really into the comics, older and younger fans, which helps. I love a good guitar solo. That is an interesting band. I listen to some prog rock and have a coworker who has been playing a lot of math rock lately, which is fun. 10 Cloverfield Lane looks pretty good. I'll definitely watch it on DVD. I'm curious about 10 Cloverfield Lane, the previews seem pretty intense. I'm getting a little tired of superhero movies, though. I like the song by Redemption! So much is happening it's hard to keep up with everything. I know my theme for the A to Z, but haven't started on it yet. Guess I should. But there are these edits ... Sigh. Hopefully I'll catch up. Congratulations, Yolanda and TF Walsh! I can't believe how quickly A-Z is approaching. Yikes. Good it wasn't that found footage crap, hate those movies or episodes that do it. Will see it indeed. It is rather surprising how well Deadpool did. Goes to show smart arse dudes and talking raccoons can surprise haha. Thanks for the info on the new Cloverfield. I've been nervous about it even though it looked better than the other film. Charles, I never want to see a found footage film again. And this film is nothing like the other movie. At all. Marcy, not a sequel at all. Shady, there is so much good Scandinavian music out there! Marie! Glad you enjoyed it. Yes, I've been a musician most of my life and minored in it in college. Play guitar now and I can really relate to your husband. Bish, you weren't, but that's all right. Your brain will be mush by the end of April anyway. Joanne, that movie had so much for adults. Looking at that image of Cloverfield Lane gave me the creeps. Can't imagine what seeing the film will do. Great movie review of 10 Cloverfield Lane! You've intrigued me even more. I agree with everything you've said in regard to 10 Cloverfield Lane. Also, I love the Captain America: Civil War trailer. The Spidey suit looks so red. 10 Cloverfield Lane sounds cool. Congrats to Yolanda and TF Walsh. Am curious to see what will be this year's A to Z theme. I've seen the previews for 10 Cloverfield Lane. I wasn't sure what to make of it, so I appreciate your review. Maybe it's just me, but I don't like my superheroes fighting one another, so the idea of Batman vs. Superman just doesn't thrill me at all. A movie about The Justice League is a completely different story. Yay for a new Captain America movie!!! Lastly, I'm rethinking A to Z. I've got an idea that would allow for easy, short posts that I think will be fun/interactive for all. Win/win. Love, love, love the new Captain America Civil War trailer. Can't wait to see that movie. I didn't see the first Cloverfield movie, but I like that this new one is a psychological thriller. Glad you enjoyed it! 10 Cloverfield Lane sounds good. I may have to see that one. I liked the Captain America trailer at first, but then why do the super heroes have to fight each other? Maybe fans like to see them fight each other and of course it can go on endlessly. Highest of sales to Yolanda! I really want to the next Captain America, though I fear Steve will die. :-( Sometimes the good guys lose. I'm ready for the theme reveal. I'm very excited for Civil War and I'm happy about Deadpool. Just as a point of clarification, I would have been on Gene Hackman's side in "Crimson Tide." Even though Denzel Washington was proven right...not a big fan of mutiny. I can't wait for Civil War. I love the Marvel movies. Ooh, I really want to see Cloverfield. I love psychological thrillers. I'm so far behind in getting to watch these movies. Just saw The Martian last night, and how long ago did you review it? Months? We saw Tina Fey in Whiskey Tango Foxtrot yesterday--exceeded expectations. Still thinking about it. Cloverfield 10--didn't know it was good. Now we can go see it. Just remember the other Cloverfield, which was awful. CONGRATS on being the Spotlight Dancer! I really enjoyed finding songs to coincide with the theme you chose - and I love the tune you chose, too! :) Have a great week! 10 Cloverfield Land really interests me. Thanks for not spoiling it. I should really figure out a schedule for movie night. Even if I have to go alone, which is something I really hate doing for some reason. Fortunately, for all the DC and Marvel films I have a plethora of nerd friends who are all willing to go as a group. Makes for a fun evening. I'm really anxious to see both DC and Marvel films. 10 Cloverfield Lane seems very odd. Maybe a little too odd first me. But I am interested in John Goodman's role in the movie. I'm in for the theme reveal--can't wait to see what people are doing! I'm intrigued by "10 Cloverfield Lane" but haven't seen it yet. As always congratulations (and thank you) to all the writers with new releases. I have to admit Deadpools action, humor and narration was well choreographed which gives it extra punch. Ugh, I get angry every time I see a Civil War preview. It makes me dislike Captain America more and more. (I'm rather partial to Stark.) I'm curious about Cloverfield. Will have to see it. I like intense movies...when I can watch at home and cover my eyes. I am the biggest baby at horror flicks. I screamed in the theater during Fatal Attraction. Sad, right? I've heard good things about the Cloverfield movie. I'm anxious to see that one--on DVD of course. I thought Signs was great. 10 Cloverfield Lane sounds similar. A reviewer gave it 4 and half stars out of five. I don't know what to make of Civil War since I've never been a fan of Spidey. But I thought my mind was made up about Hulk too and ended up loving his part in Avengers. Sean McLachlan is one great author. Radio Hope is one of my faves. I really want to see 10 Cloverfield Lane. It looks great to me and I hope the ending is good. I saw Stephen King's recommendation of the Cloverfield movie. Sounds interesting but I can't do horror movies anymore, sadly. I don't know why but they bother me, despite being obsessed with true crime stories on Dateline and shows like that. Odd, I know! How is it set in the same universe as the Cloverfield movie? Weren't they both set on Earth? I saw the original but I don't remember...I thought it was about kids in New York with a shaky-cam. I remember getting nauseous in the theater when I went to see it on a bad date. Thanks for all the news and notes. Can't believe A to Z is almost here! Cloverfield Lane sounds intense. I have to be in the right mood, but I like intense thrillers as long as they're not violent. Looking forward to hearing your theme reveal next week! I'm glad 10 Cloverfield Lane was good. It looks very intense (psychologically). I'm headed over to Amazon to see these new releases. 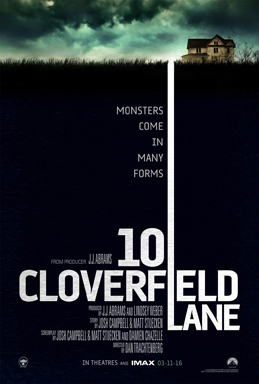 I'd love to see 10 Cloverfield Lane. Christine, you are one cool geek! Roland, yeah, he just might. Susan, I liked both, but this one is completely different from the other one. Ginni, nothing like the other one. Elizabeth, not sad, but funny! Stephanie, let's just say there are monsters in both and they are connected. But it's not a horror film. I saw on Facebook that Marie (XMas Dolly) is going in for tests (hospital). Already sent up my prayers, and I'm hoping she's doing well. I'm glad they're not going to darken up Captain America. I thought scenes from some of the Batman movies were very gloomy. Here to wish you a great week! That Cloverfield movie sounds interesting. I might check it out. I haven't settled on a theme for A to Z. I have an idea, but think it's needs to be a little more. I don't know. I've had better direction in the past. I read Civil War and thought I'd see vampires fighting with cannons. I guess it's something different. Your music rocks this Monday. Captain America looks so cool... esp with the surprise visit from Spiderman!!!!!! woohoo. WOW!!! The new trailer for Civil War is AWESOME!!! Spiderman, cool!!! Haven't seen 10 Cloverfield Lane, but I just saw an article where the filmmakers explain the ending. I've already written my "theme" reveal post. Sort of. It needs a good edit first. I have heard good and bad things about Cloverfield. I am one who really wants to know the ending before I see the movie:) I am hoping my theme is ok...I am still working things out believe it or not. I never saw the original Cloverfield and everything I've read says that this J.J. Abrams'-inspired flick is far better. And like you, Alex, the critics are raving about John Goodman (I always did like him). I've read good things about The Witch too--very intelligent, exact historical details and dialogue from the Puritan New England days, and psychologically riveting. Nice to know there are some better choices for movies. I definitely want to see 10 Cloverfield Lane. I just need to figure out how to make it to the movie theater. With two young kids, it can be tricky. I thought I had forgotten to sign up for the big reveal, but it turns out I am on the list, not as ready as I had hoped. As for Deadpool,Sarah was thrilled to find it in Argentina in English with Spanish subtitles. Even in a town where few spoke English it was crowded. So, I am not surprised. Rosey, thanks for letting me know! Lynda, you will really like it. Helena, fortunately you don't need to see the first one. I like guitar solos from country to fandango. My favorite CD is from Peter Frampton whose instrumental guitar collection is excellent. I like intense, and I like offbeat endings. Might have to check out Cloverfield soon. Also, I have a raging fanboy hard-on for Captain America. Not ashamed to admit how excited I was for that movie in the first place... and now Spider-Man? Be still my heart. Also, the guitar work in Let It Rain makes my head spin. Great song. Working to a theme can seem restrictive for any writing, but I think it actually helps us decide what we're going to do by cutting down on the options. Goodman excelled in the role - it's not quite like anything else he's played. But I didn't care for what they eventually did with his character. There was a much more interesting direction to take that, and it would've made the ending they wanted a lot stronger. I'm not surprised Deadpool is such a smash, I haven't heard anything negative about it. Love Zootopia! I thought Star Wars would end up topping Avatar. Surprised it hasn't. Congrats to Yolanda and TF! Well isn't that some cool news... 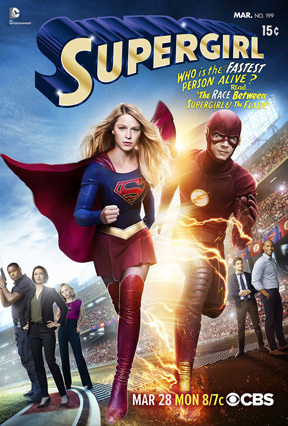 I love that SUPERGIRL show, she is a doll and this week's episode was super... well you get what I mean. Theme reveal, so soon... lol! I just wrote and scheduled the reveal post for my secondary blog the other day. I've had the reveal post for my main blog ready for awhile. Hi, Alex. I wanna see Cloverfield Lane. Loops like my kind of movie. My son has been talking about 10 Cloverfield Lane for weeks, but the only film on my radar at the moment is Batman v Superman... I can't wait!! I'm really looking forward to reading Yolanda's new book! It's waiting for me. The A to Z challenge is creeping ever closer and I'm still only on 'C' in my preparations. Must get a move on :):) Have a great week Alex. Ooh, now I want to know the big reveal of the movie. I'll probably forget by the time I get around to watching it -- my memory's like a sieve! Cloverfield Ln looks like it could be pretty eerie. Thanks for sharing the trailer and the music. I have a theme but it's complicated. I've enjoyed developing two art shows from themes in the past. Thank you for helping bring so much through your blog posts! 10 Cloverfield Lane sounds like something I might enjoy. Unfortunately, I'm not taking part in A-Z this year. Wishing you well. I'm sorry Alex, I missed this post completely this week. Bet you can't guess why!! Sounds like some good movies to watch although I will probably have to wait for the CD. Congratulations to the new authors. Wishing them lots of sales. Unable to listen to the music right now. Maybe later. Enjoyed your A-Z post! Cloverfield Lane and Captain America sound meanacing. Must see both. Let it Rain by Redemption - great song. Thank you, Alex. Love the Redemption track. I wish Yolanda and TF Walsh all the best with their new books. Congrats to the authors and their new releases! I'm not too surprised by Deadpool's success. I haven't seen it for myself but have only heard how great a movie it is, though not appropriate for younger ones. Congrats to the authors with new releases. I am interested in seeing 10 Cloverfield Lane. Have a great week, Alex! Alex, so much movie binge watching coming our way I don't know what to do but call in sick and binge watch. I'm really looking forward to Cloverfeld Lane and love psychological thrillers. Rifftrax too!!! Daughters are finally getting old enough to watch them, get the humor, and laugh their a$$e$ off. You make me want to watch that Cloverlane movie...I will think on it. And indeed that Marvels trailer is intriguing. The kids and I saw it and I think we'll see the movie.....not sure yet. I want to watch 10 Cloverfield Lane and still have to get around to watching Deadpool. In fact, my too-watch list is almost impossible at the moment. Sigh. Hubby and I have the Cloverfield Lane movie on our list, I am happy to know that it isn't "actually" a sequel. Your recommendation is all that is needed. Can't wait for it to come out on DVD. Wishing you a beautiful day ahead my friend Hugs! Brandon and Bryan, glad you liked it! Julie, it didn't even beat Titanic. Mary, the year you did all those paintings was awesome. Jo, does it have to do with bugs...? Stephen, awesome! Make little RiffTrax geeks out of them. We didn't think much of Deadpool, which we only saw last week! A lot of the 'humour' missed the mark for my husband and I. Saying that, my sister and her husband LOVED it! So ... *shrug! Devin and I are going to see Cloverfield Lane this weekend (hopefully a migraine doesn't disrupt our plans). I heard that it's really good and that Goodman did a great job in it so hopefully my expectations aren't *too* high. Have a great weekend! i love coming here for my movie updates! and those profits! holy cow! i better get moving on my goal to make a cartoon movie! maybe i can convince you to do a riff for one of my youtube storybooks - have you considered putting them on the sound pages? you can get paid for that, you know! and congrats to the releasers! hope you had a nice greenie day and have a great weekend!! Thanks for posting Murder & Obsession! So awesome! The book came out on the 10th and we left for vacation on the 11th - not great planning. They have Wifi at the hotel, but I don't trust open networks, so now I'm catching up. Thanks again! Cloverfield Lane sounds good, and that movie trailer makes me want to see the movie. Nice song by Redemption. Congrats to the authors on their new releases. So much news in your posts, Alex. I don't know how you keep up with it all! I'm glad to hear your faves, RiffTrax, will be doing a reunion show. Sounds like a lot of fun! Hi Alex! I thought I had managed to get by on Monday! But I guess not! You're so kind and supportive with my posts, and I truly appreciate that! 10CL sounds really good; I don't like bloody violent, but I do like intense! So maybe I'll catch it! I do like John Goodman as an actor. I enjoy reading about the new books that IWSG members publish. As for the A to Z Blog ... Not a hope in hell! LOL! Take care! I trust you and Mrs. Alex are having a great weekend. Shah, you either like that kind of humor or you don't. Elsie, you'll certainly be surprised by it. Tara, I might have fun riffing! Just no time. Lynn, some days I don't! Lexa, and funny he referenced that film in Deadpool. Heather, you don't need to see the first one, so just go. Sandra, been great so far. Except for the pollen. My car is yellow now. My husband wants to see that marvel movie. I'm not really into super heros though, so he'll have to take our oldest with him to see it. Enjoy the rest of your weekend. Very excited for Civil War, yes. And please to see Deadpool doing so well - hopefully it'll show studios that giving people their passion projects and a decent budget can lead to awesome movies. And thanks for the info on 10 Cloverfield Lane - I've heard good things about it, but wasn't entirely sure what sort of movie it really was. I loved 10 Cloverfield Lane! So good! Mary Elizabeth Winstead was every bit as awesome as John Goodman. It's great to see a strong female character in a role like that. And John Goodman was just so fantastic. Looking forward to Civil War, but the wait is killing my daughter. The idea of Captain America and Ironman being on opposite sides is driving her crazy. Happy Easter to you and Mrs. Alex. I'm using Blogger too. I can't figure out what I did wrong. My date doesn't line up correctly. My first blog post was April 1, 2016 for letter A. I then did a Break in that Blog and post my April 2, 2016 for letter B. The date didn't change. It still shows April 1st. What do I do at this point?